Fri., April 10, 2015, 10:25 p.m. Here's the revised Statement of Purpose for the transportation bill, HB 314a. 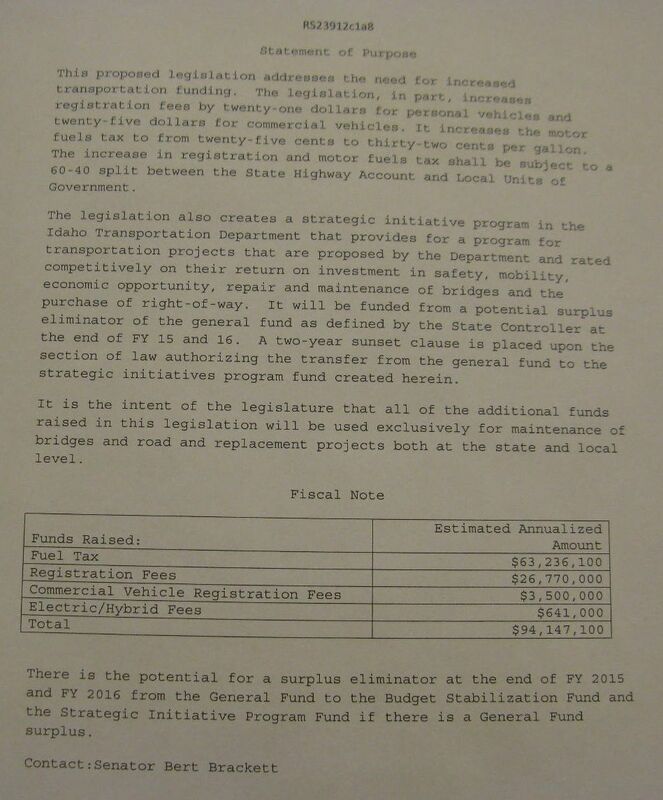 It shows that the bill raises a total of $94,147,100 for transportation. That includes $63.2 million from the 7-cent increase in Idaho's 25-cent per gallon gas tax; $26.8 million from increased registration fees on cars and light trucks; $3.5 million from fees on commercial trucks; and $641,000 from new fees on electric and hybrid cars of $140 on electric cars and $75 on hybrids. "It is the intent of the legislature that all of the additional funds raised in this legislation will be used exclusively for maintenance of bridges and road and replacement projects both at the state and local level," the statement says.